This Flarum extension will add SEO tags to your Flarum forum site for search engines and social media. It will make sure your site will be visible correctly by adding page identical title and description using the discussion content and title. While I'm still working on this plugin and I still wait for the results to show up in Google, the results in Google by using this plugin in the current state are for your own risk. Slowly I see better search results for my own Flarum forum. It should improve with all metatags and data that are added. If you have any feedback, let me know! Do you experience problems? You can report issues on the Flarum Forum or on GitHub. 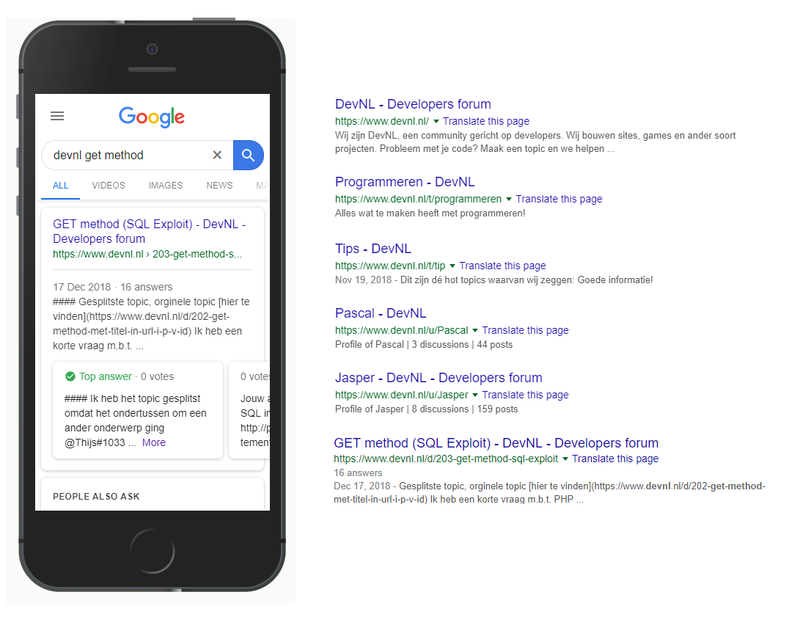 By default, this extension creates an Question Answer result for discussions in Google and other supported search engines using the QAPage schema.org tags. Check the screenshot below how that looks like. However, this setting will load all posts with usernames and likes. There is no caching for this yet. This can be heavy for your server. When this makes your forum slow, you can turn back to the default SEO and check if that helps. The only way (right now) is to go to your database, then the table settings, and add the key disable_fancy_discussion_seo with the value 1. How do the results look like in Google? How long will changes take effect? It depends. Recrawling can take a few days, up to a few weeks until most of your results are updated. Use the Flagrow Sitemap to let Google know what discussions there are on your forum. You may speed it up by manually update a search result Google via the Google Search Console, but that is no gurantee that the search result will be updated directly. You like what I did? when I use like this, home titles completely adding to of discussion title. JasperVriends New problem, If i add any image with embed code and manually post that discussion on twitter, embed image not appear on tweet, just shows site favicon. Why does ignore embedded image within the topic? This code needs to be updated dynamically. Please fix it for twitter and facebook. Cool, Flarum needs something like this badly. Sadly i can't test it at the moment until some plugins are upgraded to Beta 8 and i can update my forum. Good job and thanks for the hard work. For a few weeks I have been closely following the progress @JasperVriends made with this code. I'm very excited to see this extension finally published, especially for free! The integration with other extensions and quality of this code is amazing. I'm hoping to see this grow into one of the most valued extensions our ecosystem has to offer. Great job! I'm recommending this extension to anyone taking SEO seriously. This extension solves an issue that has daunted Flarum for quite some time. This extension is completely FREE of charge, best SEO tool yet with added hooks into other extensions. Moved the repository to v17development/flarum-seo as my organisation stands for open source and will be easier to maintain by future employees. Thanks to @ziymed for his pull request on Github, Arabic is now added as supported language! Added potential searchbar to the Google results. I'm not sure if this works yet, we will see within a few days. Remove the old package, install the new package. The package url won't change anymore. Have you considered this issue when making this choice? When the username is numeric that wouldn't really work. For example, /u/12345 would look for an user with the ID 12345 and give 404, instead of looking for the user with the username 12345.
matteocontrini Actually not 😂 I saw that Google crawled both my user profile pages, so the username URL and the ID URL and thought that username would be better. How does the default qa thing work. Since my site isnt question and answers how does it pick which post? Also can you explain a little more about the increase server load? Whats going on in the background to increase the load etc? It depends per discussion how it will effect the loadspeed of the webpage. It loads all posts at once and then makes an array and serves it as json. But there is no caching in that part yet, so it will load the posts again and again per page load. So that part is not perfect yet. I need to figure out what will be the best way to serve it. JasperVriends It loads all posts at once and then makes an array and serves it as json. But there is no caching in that part yet, so it will load the posts again and again per page load. So that part is not perfect yet. I need to figure out what will be the best way to serve it. I guess my question is whats the purpuse of that operation? Is it creating and adding all the meta tags during this operation when being visited by a direct link? The default description of your site can be changed in the 'Basic' settings at the Admin panel. Hey @JasperVriends great work so far. Got this installed on my forum. Is there a control panel to disable/enable certain features? Is there anyway I can remove the "description" tag under each post? I want to do this because it's picking up raw BBcode and include that into the description. If I don't have the QnA extension installed, and I don't plan on installing it, will the default settings slow down my site? Pic reference to question 2.
bin it's picking up raw BBcode and include that into the description. I feel like there could be a way for the extension in the future to strip the bb code? Hi there. Not want to disturb or interfere with any communication here, but I thought since you're willing to try the plugin and I spoke with him not a long time ago I can answer your questions as good as I can. There is no control panel yet, this is planned for in the future. I don't know if it is possible to remove the description tag, I do however know that in the coming week an update is planned to filter markdown and BBcode. It is planned. If you'd like you could create an issue for it? I'm not sure if this will slow down your site. It does exactly the same but leaves the "Answer" mark gone. PascalB Thank you for that. If it's already planned, I'll skip the issue ticket. Will be waiting for the update. This is a very useful and revolutionary extension for Flatum, but I’m not understanding how to edit meta tags or the Open Graph. Is that even possible? JasperVriends do you load all the posts for a discussion? Google shows only five of them, so it wouldn't make much sense to extract more than that. I do not know if it affects the search results if I limit the posts of all discussions to 5 to index, but that is for sure something that we could considder. Google does also index all given posts by the way, so that is something usefull I think.